I’ve been on a bit of a roll with mulled wine this week while coming up with the Single Gourmet Traveller’s Mulled Wine Recipe for Waitrose Cellar. Amongst the six bottles of wine Waitrose sent me, I found a bottle of their own, ready-made Mulled Wine that comes in one neat bottle and needs no more effort than gently heating it. Of course, I couldn’t use that for the mulled wine recipe … I had to start from scratch … so I put the bottle to the side. 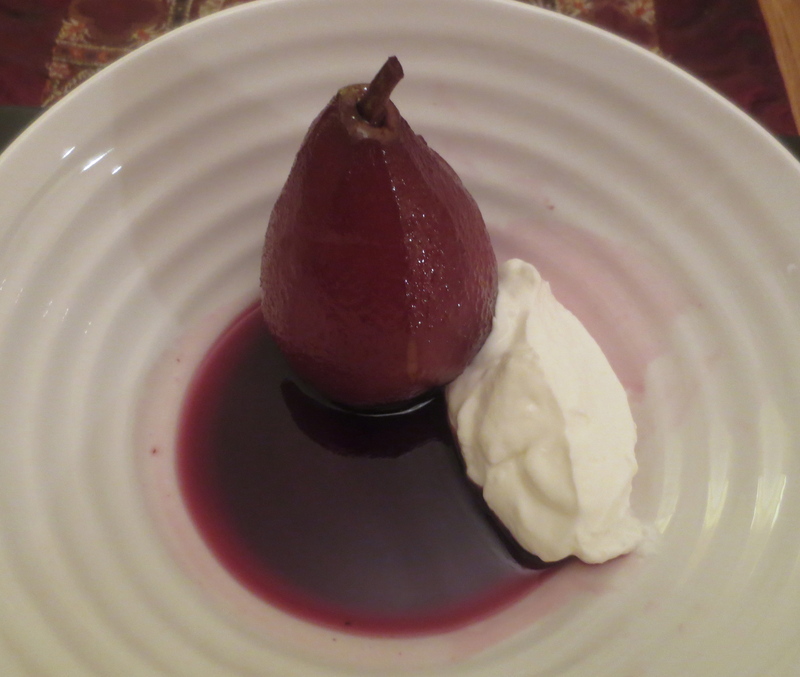 Then on Sunday when I was thinking about Jonathan and Lyndsey coming round for supper and what I’d make for dessert, I remembered they love poached pears. 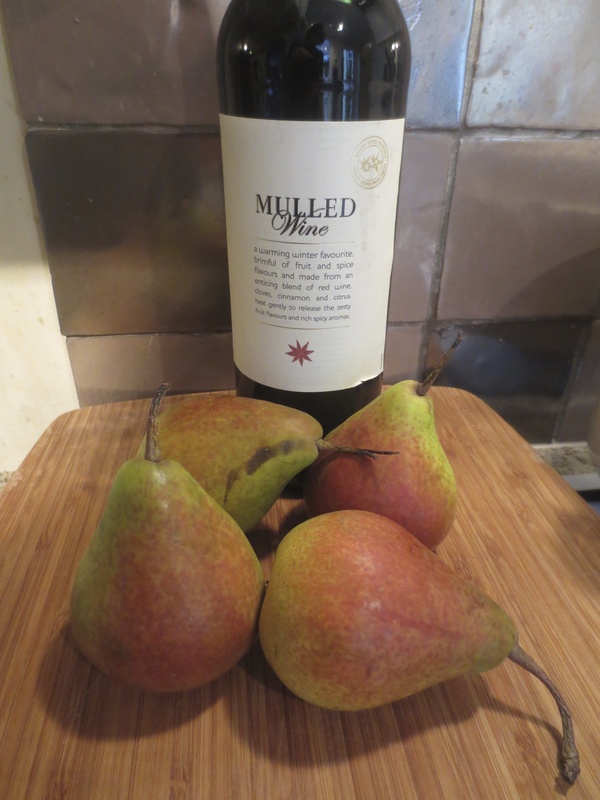 Pears in red wine, I thought. But then I thought: Instead of opening a bottle of wine and adding the usual spices and sugar, I’ll open the Mulled Wine. I thought that was a bit of inspired thinking for a Sunday afternoon and it did make the whole pear poaching exercise even easier (not that they’re that difficult to make). I had 4 nice pears. You don’t want them to be too ripe or they’ll fall apart, but they shouldn’t be rock hard either. 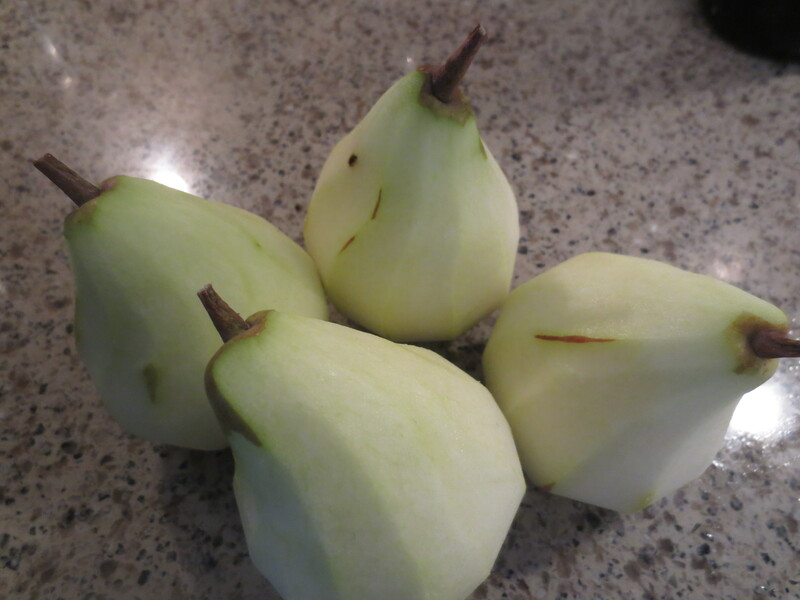 I trimmed the stems because they were very long and peeled the pears. 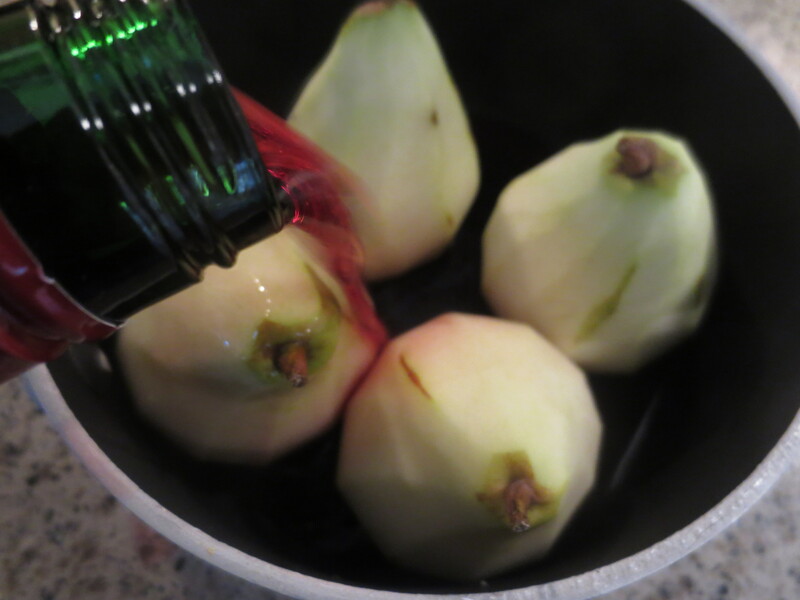 Then fit them fairly snuggly into a saucepan and pour over about half the bottle of Mulled Wine, so the pears are about half to two-thirds in liquid. 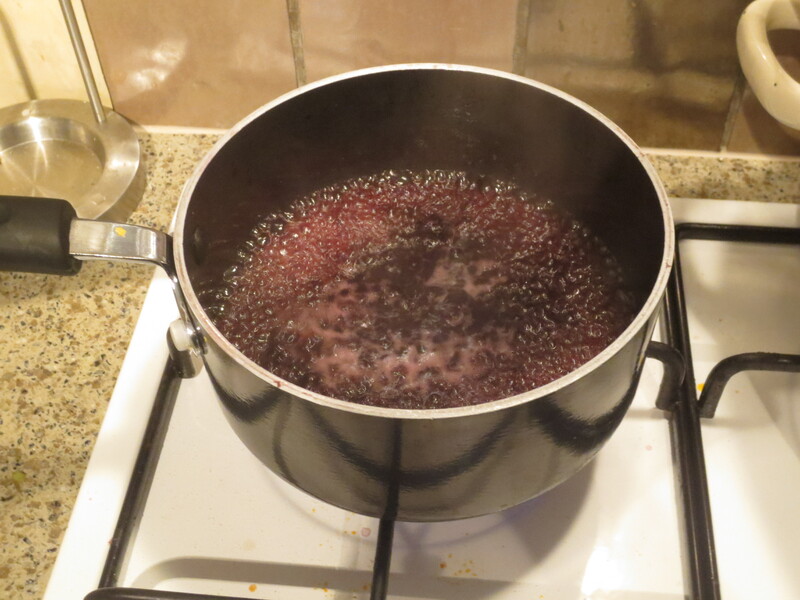 Bring to the boil and then leave to gently poach, with a lid on, for about half an hour. Timing will depend a bit on the ripeness of your pears and the type of pears you use. You can check by gently piercing with a sharp knife when you think they’re done to see if they’re cooked all the way through. You’ll also need to turn the pears from time to time so they poach evenly. About halfway through, I tasted some of the cooking liquid. I hadn’t added anything at all to the Mulled Wine. I thought it needed a bit more sweetening so added 2 tablespoons golden caster sugar and stirred carefully to help it dissolve. 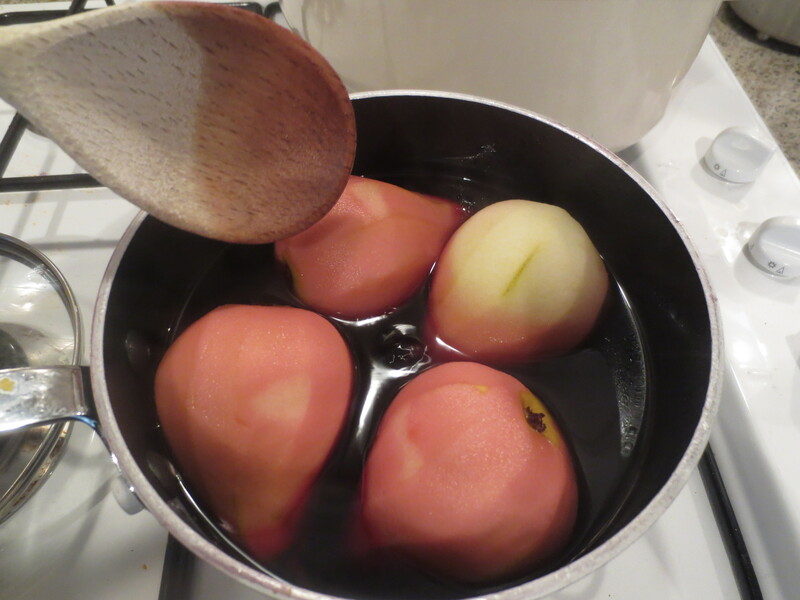 Once my pears were done, I transferred them to a bowl, leaving the wine-syrup in the pan and then boiling it off briskly until well reduced and thicker and more syrupy. I poured this over the pears and left them to cool. Once cool, I transferred to the fridge until suppertime. I think they’re nice fridge cold rather than room temperature. I served them with some thick Greek yogurt on the side. We all loved them. Using the bottled Mulled Wine worked brilliantly and the taste was excellent. If you have some left over you could just heat up the rest to drink mulled wine, or maybe set it into jellies with some gelatine. And, of course, if you have some mulled wine left over from yesterday’s recipe, you could use it in the same way. Check out Waitrose Cellar for more mulled wine ideas by clicking here. Thank you! 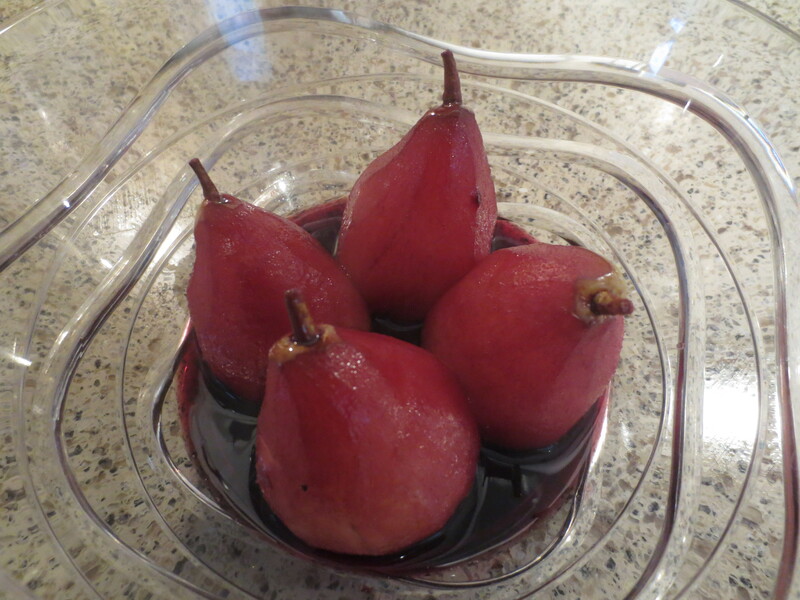 We all love poached pears and it’s such an easy way to make them.